Lately, I have been really interested in surface development and I have been having a great time experimenting in the studio. But, I would probably be more likely to take bigger risks if I didn’t labor over the forms as much as I do. So I have been thinking about doing a little slipcasting to minimize the preciousness of my forms and hopefully, get the surfaces to where I want them. 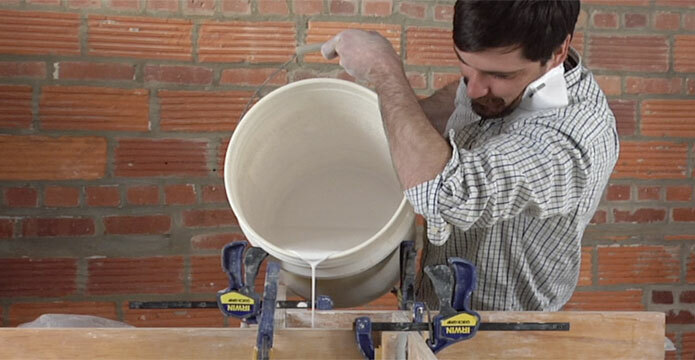 So, with slipcasting on the brain, I thought I would share a few tips from Guy Michael Davis for pouring good casts. It’s from his video Fundamentals of Mold Making and Slipcasting, which is available as a download in the Ceramic Arts Network Shop! Mike also shares his recipes for casting bodies. – Jennifer Poellot Harnetty, editor. This clip was excerpted from Fundamentals of Mold Making and Slipcasting, which is available in the Ceramic Arts Daily Bookstore. To learn more about Guy Michael Davis, and see what he’s up to in the studio, please visit his blog: http://guymichaeldavis.blogspot.com/. Thank U Michael! I gonna use it. good video. I find the use of an xacto knife a little worrying too. I also use a fine plastic spatula, like you might use to clean a kitchen bench. Then I clean the rim up just with a sponge and water. As it is casting slip, the particles are very fine so you are left with a smooth rim. I like the use of the plastic mesh object to drain on. and if it is vinegar/water what are the ratios? and lastly why use vinegar and not just plain water ? when your finished your slip should coat your hands so you can barely see your nail bed and web between your fingers. There is another trick for making the top of the cast item level after removing from the mold. Use a smooth surface (counter top, plexi-glass, wheel bat) to your advantage. After dampening the rim with water turn the cup upside-down and rotate while firmly holding. Remove excess clay from rim with a damp sponge as directed in video. Another trick to lessen hard spots from silica is to pour the slip so that is makes contact with another item (I use a small plaster wedge) before it enters in the mold. Generally speaking the first spot the slip hits make a hot spot (dense concentration of the sodium silicate) and appears darker and less willing to accept glaze. Good tips about the metal/plaster no-no! At the other end of the scale there is a video of pouring toilet moulds at Kohler; awesome as shirtless guys fill with hoses, and empty dozens at a time! Its is not good practice to use metal tools with plaster molds, these will cut into the plaster and any surplus clay trimmings will become contaminated with small shards of plaster. For a realy smooth and straight rim the mold should be at least 1cm (1/2inch) larger than required and the excess trimmed afterwards, a simple guide line can be incorporated in the initial cast to aid trimming. If the molds are kept slightly warm befroe casting obsorbtion of excess slip is quicker, also a slight tap after the initial pouring of the slip will help release any trapped air bubbles. Lucia, ‘Google’ Paul Wandless. He has a method for turning your modelling clay into a slip body. If you want to avoid overflow mess and make it easier to trim the edge smoothly every time, make your mold about 1/2 inch deeper than the finished form, and step that extra depth back about 1/2 inch (that is, its diameter is about 1″ greater than the top of the form you’re casting). You can then overfill the mold without spillage, and when the slip is set sufficiently, you can trim the edge with a flexible plastic tool using the ‘step’ as a guide. (My favourite ‘tool’ for this is just the plastic handle off a sack of rice!) I then smooth the inner edge with a damp sponge while the piece is still in the mold, as there’s no risk of deforming the shape… the outer edge is done later, when the piece is dry. This extra overfill area also protects the edges of the mold itself from damage during handling… any nicks etc. will just be in the overflow area, so they won’t affect future pieces cast from it. And using a soft plastic trim tool helps the mold last longer, too. This is great for beginners like me who haven’t mastered a recurring even form on my work. Thank you for sharing this. 1. Why add vinegar to the water that is used to modify the piece after drying? 2. Can this method be successfully used to form mugs, to which handles are attached at the leather hard stage? 3. Plates? Could i do this successfully to form plates? Lucia – there are many commercial casting bodies on the market. Check with your local ceramic supplier, or try google. I bought a kiln about a year ago and it came with about 500 ceramic molds and then I saw 1200 more in the paper. I have made cups, plates, pitcher, platters and other serving pieces. This is so much fun. Right now, I am using Standard 259 brown stoneware. Is there a recipe for making my own casting slip, or can I buy slip already made?